Social media is constantly changing and adapting to everything that’s happening in the World. This changing pace is so quick that you could be doing one thing one week and then having to change this for next week! One major example is the Stories feature that was introduced on Instagram first, and now it’s on almost every platform that you visit! Not only that, but users are beginning to post on their Stories a lot more than your timeline. I bet you could go on your Facebook or Instagram account right now, and there would be a whole load of Stories for you to view! (Unless you did that before reading this article). Most businesses are keeping up with the times too and are now posting onto their own Stories! For businesses to be able to succeed on social media, they need to stay ahead of the competition and the trends that are happening now! Below are some social media trends that are happening right now! As of 2017, Business Insider has reported the top four social messaging apps and currently, they are WhatsApp, Messenger, WeChat, and Viber. This surprised us as we had expected Facebook Messenger to be higher than WhatsApp! These four social messaging apps were then tested against the top four social media apps which were Facebook, Instagram, Twitter and LinkedIn. The social media apps were more dominant than the social messaging apps up until the first quarter of 2015 when social messaging silently surpassed the social media apps and ever since then, the social messaging apps have always been slightly better than their social media counterparts! Did you know that there is a constant growing rate of mobile messaging users? Just under 50% of users prefer to shop with a business that they can message online. Some good news about the above is that Facebook themselves are constantly helping businesses to find new ways to reach their customers by messaging apps. Sticking with the social messaging apps theme, chatbots have become quite popular within businesses and their techniques of messaging and responding to clients. As the messenger apps have grown, so have the chatbots and the number of them. We have seen the number rise from 33,000 to a whopping 100,000 in just one year! Some popular social messenger apps that currently have chatbots include WeChat, Slack, Viber, iMessage and more! A survey that was produced by Oracle has discovered that 80% of senior marketers and sales executives are already using chatbots for their business, or they are planning on using them by 2020. Chatbots have been adapted over the years to be able to do a wide range of features such as market products, authenticate payments, deal with questions and complaints, and much more! If you are business that is not yet using a chatbot for your business or clients, then a great place to start is installing one onto Facebook Messenger! Social media has entirely changed the way customer service is dealt with. Conversations between customers and companies are also totally different to how they used to be. The main way that this has all changed is down to business exposure and trying to make apologies or complaints more public for everyone to see. This has been evident recently as you can easily search for a business and you can guarantee that not far behind is a public complaint. Even though some complaints are very small, it is still important that ALL complaints are acknowledged as ignoring one complaint can have repercussions. Responding to social media posts about your business can have several effects for your business, and these effects are mainly positive too! 73% of users will share the positive the interaction with friends and family. Popular social customer service tools include the likes of Facebook Messenger, Twitter, Hootsuite and many more! Content is big on the internet, and did you know that the most popular content type is still video? On Facebook, videos are the most eye-catching and user friendly way of gaining engagement as people are more attracted by the content and what each video has to offer. According to Buzzsumo, 2018 will once again be year of the video! Putting together a video about your product and/or service is more impactful than talking about it in a status update! It is a well-known fact that user-generated content is an easy way to drive reach and engagement. The content that users generate is seven times more likely to gain engagement than a brand-generated Facebook post. Also, on top of this, seven times more users trust user-generated content over advertisements. 56% of users are more likely to buy a product after seeing a positive, user/customer-generated review. User-generated content not only helps to drive more engagement and reach to your product, but also makes more and more users trust your product or service if they continue to see positive reviews and posts about your business. 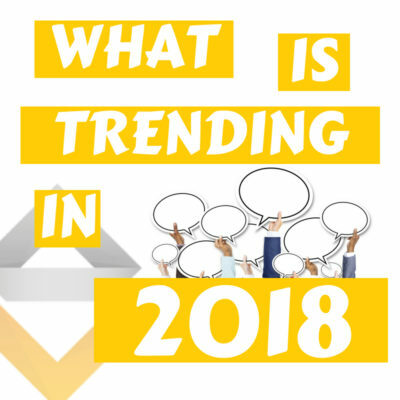 What do you think of some of the trends set to happen in marketing for 2018? We hope you have a splendid day or evening and hope you check out some of our other blog posts!